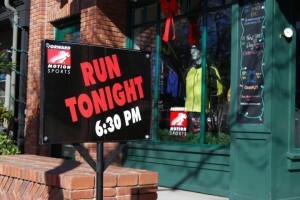 Forward Motion Sports world famous Wednesday Night Run switches over to the Winter Route on Wednesday, October 11 at 6:30 p.m. The route features 2, 4, 6, and 8-mile loops. All ages and abilities are welcome. Please wear reflective gear and light-colored clothing as it’s getting dark earlier and earlier. As always, meet at the store, located at 432 Hartz Avenue in Danville, at 6:30 p.m.
Reflective bands 2 for $5.